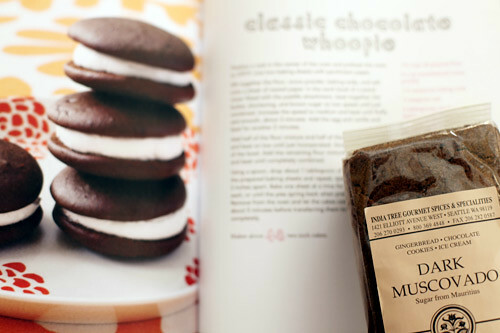 I just tried out a book that’s all about Whoopie Pies. 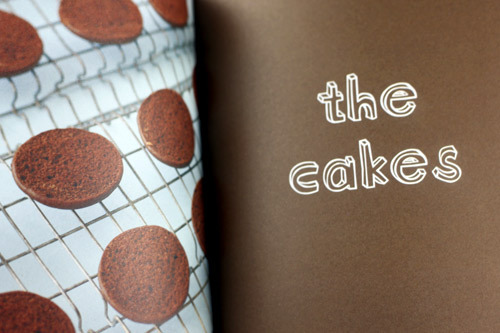 One of the writers of the book (Amy) is also the editor of my book, Cake Pops. Amy sent me a copy to check out and I couldn’t be more excited for her. 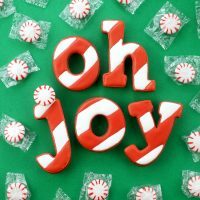 It’s funny… when I gave these treats away, everyone loved them, but no one knew what to call them. Everyone asked “What are they?” It made me wonder how common they are in other places. Have you made whoopie pies? Heard of them? Seen one out in the wild? No worries if you haven’t. Now you can make your very own. The book is organized for easy reading. And a section devoted to fillings. Great for mixing and matching and making whoopies. Lots and lots of whoopie. 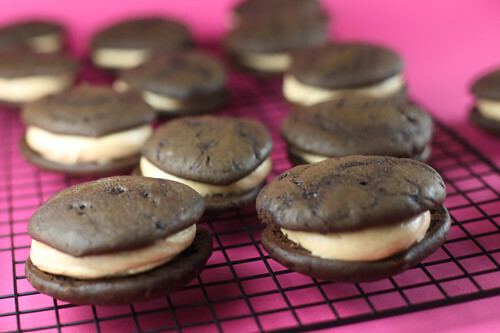 I decided to make the classic chocolate whoopie (big surprise) and paired it with peanut butter filling. The recipe called for dark brown sugar. I used this dark muscovado sugar instead because that’s all I had on hand. It made them extra tasty. 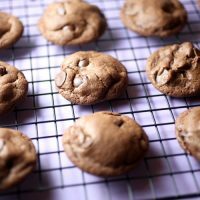 After you mix up the batter, drop it by spoonfuls on a parchment covered baking sheet. 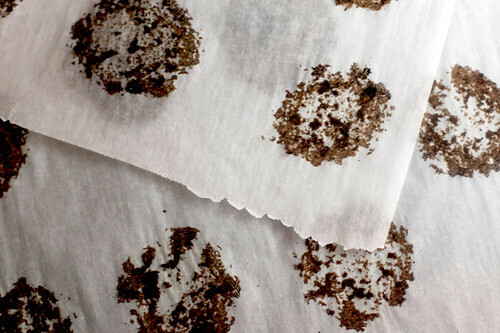 After they bake and cool for a few minutes carefully remove them from the parchment paper. I like piping it on. It’s much more fun. And prettier to look at. Sandwich the filling between two of the cakes. And press gently. That’s it. 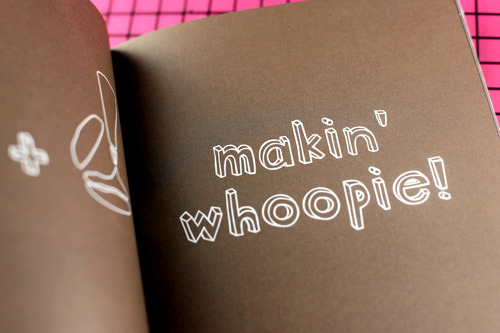 Whoo-hooo for whoopies. Now go make some. You can also roll the edges in sprinkles, chopped chocolate, nuts, etc. or in this case, peanut butter morsels. Ummm… can I say these are just about the most fun things to eat. They’re so good you kinda feel like you’re being bad when you sink your teeth into them. Want to make some whoopies? Amy sent me a second copy to do with what I want. And I want to give it to one of you. Want it? 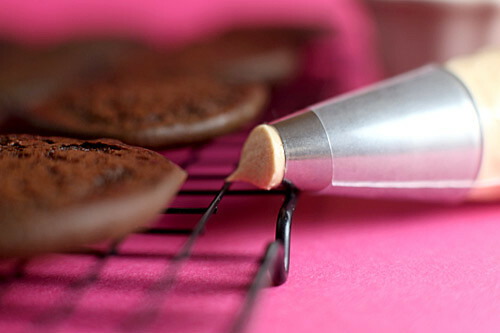 Leave a comment on this post and tell me if you’ve ever made whoopies… Heard of them?… Know the best place to get them? Or just want to learn more about them. Deadline to enter is Monday, July 12 at 5:00 p.m. ET Sorry, Time’s Up. Winner announced below. Whoopie!!! We have a winner and boy are they in for a treat. 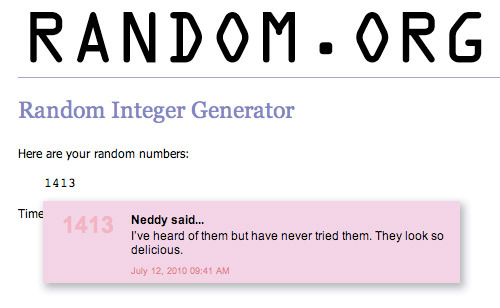 Congratulations Neddy (# 1413). 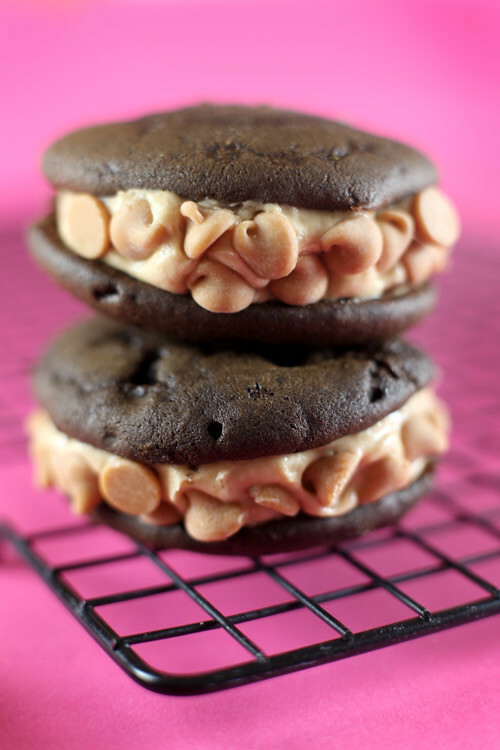 Now you can try lots and lots of whoopie pies. I attempted to make them once. They’re very popular in Maine, where I live, so I figured I’d give it a try. I did not use parchment paper, and managed to burn them and stain my brand-new cookie sheets. I’ve been terrified to try again since then! they look really good! i wish i win! Never won anything in my life! I love Whoopie pies!!! The first ones I made were Red Velvet cake ones!!!! First one I tasted was from the Tea Cake Bakery in Emeryville Ca. I don’t think I’ve ever seen them before, but I can tell by the pictures that I would probably eat them until I exploded! I love sandwiches and I love cookies…these look like the perfect combination. 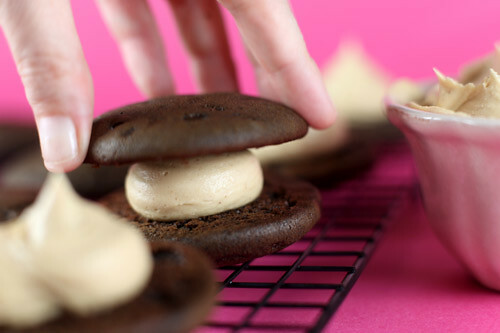 I’ve never had whoopie pies but I’ve seen them a lot lately and would LOVE to make some! Yum!! i have heard of them but never had any. kinda reminds me of those oatmeal pies. I would really like to try to make them. I have been looking at all the recipes on your website. they look totally awesome!!! Today must be a day for whoopie pies, because I had my first attempt at them this morning! My sister and I ate our first whoopie pies on Friday and so the attempt to recreate them began. It was a…moderate success. It ended up more like a cookie than a cake, but it was still yummy! 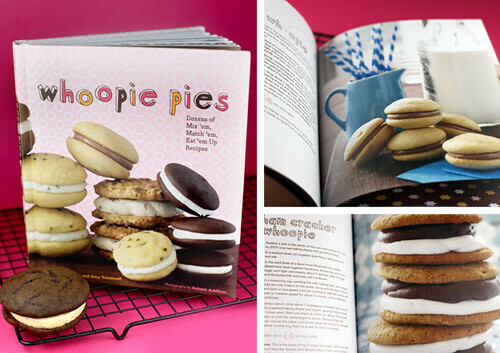 i’ve always wanted to try to bake whoopie pies! you’ve just inspired me to finally try it. I think these might be similar to moonpies? 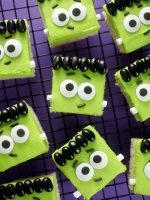 In any case they look like so much fun to make, and even more fun to eat! I’ve heard of them but never eaten one and never made one. Love that you can mix and match cake and filling!!! Looks like you’ve got yourself an awesome editor, too! Can’t wait to see your book! I have never heard of them before! They look fantasticly evil! I love making red velvet whoopie pies… who doesn’t love bright chocolate cakes filled delicious ooey gooey cream cheese frosting?? 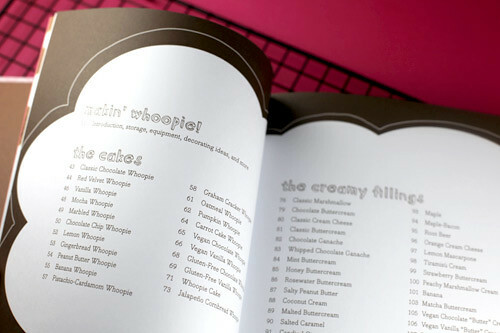 I wanna make whoopie pies!! Thess look amazing! Love pb and chocolate. i’ve been dying to make whoopie pies but haven’t had the time to do it yet! I may have heard of them in passing but i’ve never had one! Looks very yummy though! I’ve never made them but it looks like they’re going to be the next cupcake. I’ve never made ’em but i’ve eaten them! And if I get the book I will make ’em for sure! Wow. That looks delicious. I need to make some of these!! I have actually never had one! But I see them on your site and they look soooooo delish!! I’m gonna have to make them sooner or later. My husband grew up in New England and is very familiar with whoopie pies. 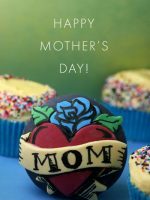 They are his dad’s favorite dessert and so of course hubby loves them too! My sister-in-law makes them whenever her dad comes to town, but I don’t think I’ve ever tasted one. I’d love to have the book! I have never made whoopie pies before! but would love to try…i bet they are way better than the prepackaged ones. yum!! OMG, I’ve been eyeing this book all week!! I make red velvet whoopie pies with cream cheese filling and EVERYONE loves them. I want this book so bad!! I believe whoopie pies are an east coast thing. 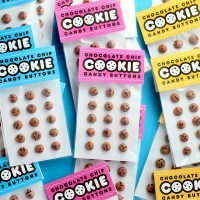 A popular company makes them that been featured on the Food Network show Unwrapped. I’ve had chocolate whoopie pie with the vanilla filling, so good.. reminded me of an upscale oreo! They look a lot like French “macarons” which I absolutely adore but have yet to attempt on my own. I’d like to try making these and see how they compare! My mom used to make whoopie pies for us all the time as kids! Apparently, they are really popular on the East Coast (she is from Boston). So yummy!! Funnily enough, I just heard about them today. A blogger (based in Scotland) I read was talking about how wonderful they are and how a journalist in Britain was disparaging the American treat as being too sweet. 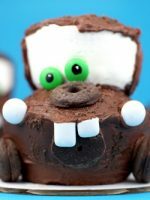 They kind of remind me of oreo cakesters! But a thousand times better, I’ve never had either one but I’m determined to make some… along with ALL of your other recipes you’ve shared. It might take me a year but these look delish. Those look so delicious! I have always been curious about making them, I might have to give that recipe a try! I have never made them, but they look good! I actually knew what they were, but did not know they were called that. My niece and nephew are in town so i might try this out for them. Thanks! Ive heard of them but never tried one! 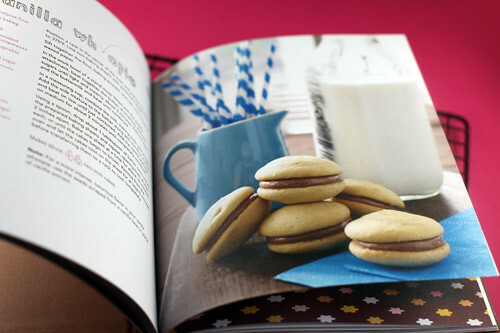 This book looks amazing and YUMMY! I have had them many times, but never made them. Here in CA they are pretty common and every grocery store bakery section sells a version. They were also pretty common as I was growing up on the east coast. I’ve only made chocolate cakes with cream cheese filling. We’ve always called them homemade oreos, but I’m excited to try different varieties. I have heard of them, but have not tried baking any yet. 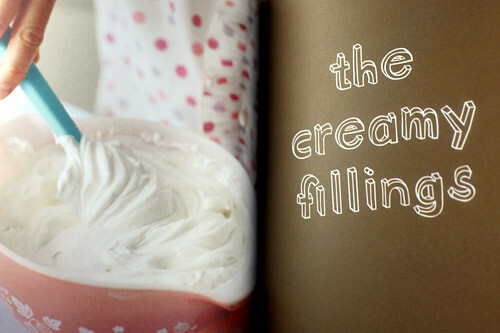 They sound delicious…looks like another great book to add to my wishlist! I’ve never had them or made them but PB & Chocolate is my love language. I can’t wait to try this recipe. 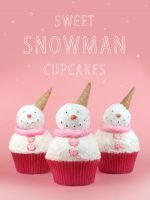 I’ve never made them- but I sure want to now!!! I’ve always wanted to make them but found them intimidating! This book looks fabulous though! I have heard of whoopie pies but never had one. I’d love to make some, though, as it has been quite some time since I’ve baked anything “different” and I am longing to fix that! 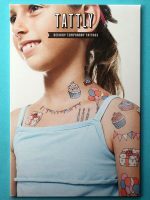 :) Looks like a great book (oh, and BTW, my 7 y/o dd just asked me to put Cake Pops on her Amazon Wish List!!) :) Thanks for the opportunity to learn more about whoopie pies. I have seen these before but have never tried them. I look forward to trying these. These look great! I’ve heard of them but have never tried them. My pregnant belly neeeeeeeeeeeeeeeeeds these! I have never made them but I would love to!! They look so beautiful! 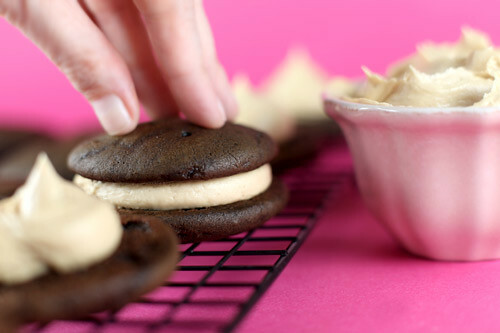 I have never made whoopie pies but I’ve always wanted to try…they just look so hard to make! I’ve made pumpkin with cream cheese filling whoopie pies. Oh, they were delicious. I’ve heard of them, but didn’t really know what they were. I would LOVE to try them out! These remind me of an adult version of one of my favorite Little Debbie cakes we ate as a kid! I would love the chance to make some of my own! Whoooooooooooopieeeeee!!! I heard about whoopie pies on a show hosted by Paula Deen’s sons and then I saw them in the grocery store a few years later. I was OBSESSED with them but then my supply got cut off! I want them to become the next big bakery thing, like cupcake-level popularity. I made pumpkin spice whoopie pies with cinnamon cream cheese filling for Thanksgiving this year – they were fantastic! 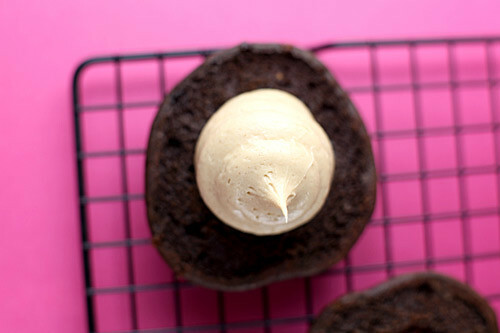 I never made Whoopies… but after this post, I will make them. Thanks! I’ve heard of them but have never made them. Yours looks soo good I might have to this week! Yes and they are fantastic! I cant wait to get the book and try all the great combos! I’ve heard of them before, but have never had one! They look delicious and I would LOVE to have that baking book since I have time to bake now since it is summer! I made the red velvet sandwich cookies you posted for Valentine’s Day. Would those be considered whoopie pies? I have never made whoopie pies, never had a whoopie pie, never seen a whoopie pie. 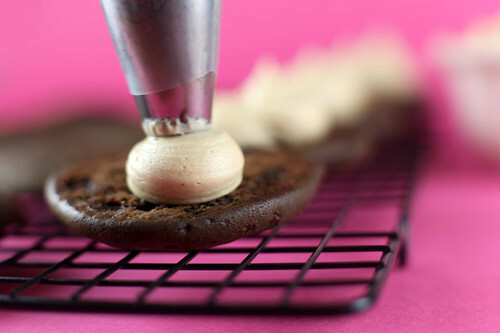 But after drooling over those pictures I would love to make and devour some whoopie pies!!! I actually saw an episode about these on Food Network. They look so easy to make and I’m thinking about making them for party favors for my daughter’s party. I would love a book on them. I’ve never heard of them, and I’m fairly certain that my Weight Watchers lady will NOT approve, but I’m going to give them a go this weekend!!! NOW I see what it is you are baking and am relieved to not have to cover my eyes! I’ve never made whoopie pies before but they look yummy! 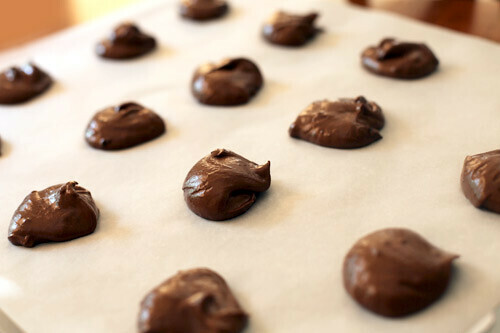 I would love to try the chocolate and peanut butter ones you made. Never heard of them, but now I’d like to make some! This is so random because I was just reading the review for this book online on Friday! I would LOVE a copy! Have heard about them, dreamt about them and made an Oreo version of them. Please let this be my lucky day! Fun! I love me some whoopie pies. I’ve made the classic chocolate with marshmallow creme filling. I love the idea of making them mini! What a fun book that would be! Heard of them. Love them. Cant wait to make them myself. Thanks for the recipe! Now, if I only had a whole cookbook of them….. I have never heard of whoopies before, they look delicious. 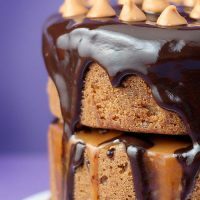 I love peanut butter and chocolate together, I’m gonna have to try these! I have heard of them but don’t think I have ever had them.. They look delicious! I’ve heard of them, but I can’t remember ever having one. They look and sound delicious! 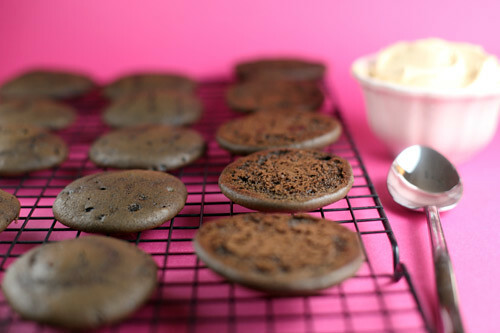 I love whoopie pies, got the pan at William Sonoma and just used there boxed red velvet wp mix. Cake was good, filling wouldn’t turn out fluffy but still good. Would love to have the book to make new kinds. I’ve never made them myself. When I lived in Japan, my neighbor (also American) would make them at Valentine’s. Those are the only time I’ve had them…but so good! Will have to give them a try! YUMMO! these look oh so good! Heard of the but have never had a homemade one … saddly only packaged. I would love the book to learn more! Oh yes. We like the chocolate ones, but my favorite is pumpkin whoopies with cream cheese filling. Yumm-o. I preserve pumpkin just for these! I’ve heard of them but never made them. The book looks so fun. I have never tasted whoopies before. This is a perfect opportunity to try them. Thanks for the recipe! I’ve made whoopie pies before. They were delicious and cake like. However I accidentally made the scoops of dough too big so they turned out ginormous! I have heard of them but have never mad any. They sure do look yummy! I’ve never made them before! But I’ve had some with ice cream centers! Delicious!! I’ve heard of them, but I’ve never eaten them or made them. I’d love to have that book though. They look wonderful! Heard of them, ate them, never made them!